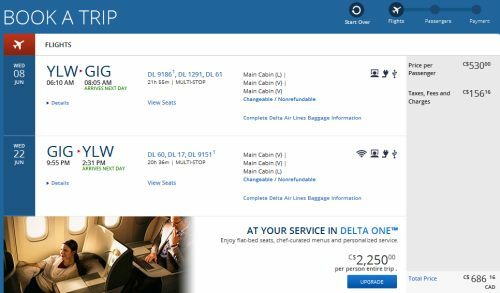 United Airlines and Delta are showing flights from Kelowna to Rio de Janeiro, Brazil for $647 to $687 CAD roundtrip including taxes. This is a new record for the cheapest flights from Kelowna to Rio de Janeiro. The $647 CAD flights are in April and May 2016. 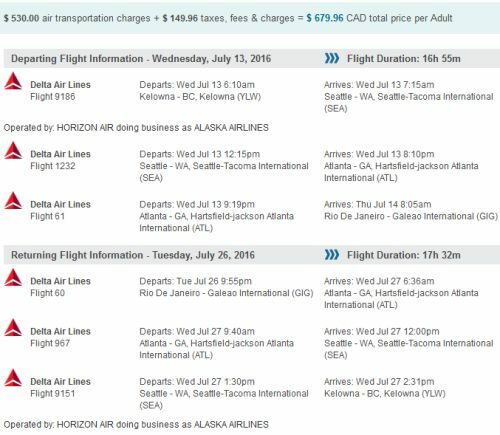 But what might be even more interesting is that June 2016 flights have dropped to $687 CAD roundtrip. 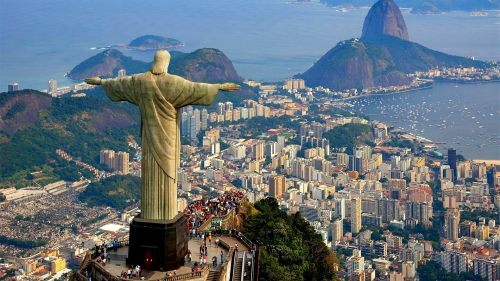 This is interesting because Brazil is waiving the visa requirement for tourists visiting between June 1 and September 18, 2016, due to the Summer Olympics. Update 4/22 @ 9:46 AM PST: July and August 2016 dates are now available! See update below. 2. Once you've found your dates on Google Flights, try searching for the same dates on Kayak and then clicking through to the Delta or United website for booking. I would use a flexible date search when you get to Kayak. You may also be able to go directly from your Google Flights search to the Delta or United website. Update 4/22 @ 9:47 AM PST - July and August 2016 dates are now available for $669 CAD roundtrip including taxes! 2. Go to FlightNetwork.com and try searching for the same dates. 3. Use the Flight Network promo code to take off another $10. kelowna, YLW, flight deals, delta, united airlines, south america, brazil, rio de janeiro, gig or rio.